Les business models ouverts (Chesbrough, 2006) font référence à des modèles qui promeuvent une division du processus d’innovation et de l’organisation du partage de connaissance avec des parties prenantes, et éventuellement des concurrents. Dans cet article, nous tentons de répondre à la question suivante : quelles sont les conséquences, en termes de performance dans le temps, de l’adoption d’un business model ouvert ? NouSs étudions le secteur du jeu de rôle aux Etats-Unis dans lequel le leader est passé d’un business model propriétaire à un business model ouvert avant de revenir à une approche plus fermée. Plusieurs leçons peuvent être tirées de cette étude de cas. Particulièrement, nos contributions portent sur la dynamique des mécanismes de la création et de la capture de valeur, les effets imprédictibles d’un business model ouvert et les risques et faiblesses associés à un tel choix. Among recent innovation, open business models (Chesbrough, 2006) refer to business models promoting a division of the innovation process and organizing knowledge sharing with coopetitors. In this paper, we address the following question: what are the consequences, in terms of performance over time, of the adoption of an open BM? We study the U.S. Role Playing Game industry in which the leader moved from a proprietary business model to an open one before coming back to a closer approach. Several lessons can be drawn from the case study concerning especially the dynamics of value capture and value generation mechanisms, the unpredictable effects of an open business model and the drawbacks and risks of such an initiative. We would like to thank all the participants of the BETA seminar on business models held in Strasbourg, for their comments on an earlier version of this article. A special thank for Emmanuelle Fauchart for her accurate comments and the suggestions she provides. This research benefits from a grant from LMCU (Lille Métropole Communauté Urbaine). 1Today, business model (BM) tends to be considered as the main driver of the performance of organizations whatever their sector. The literature stresses particularly how BM innovation may disrupt competition and create competitive advantage (e.g., Casadesus-Masanell and Ricart, 2010; Giesen et al., 2007; Johnson et al., 2008; Svejenova et al., 2010). Innovation in the domain has been prolific since the advent of the Internet era and numerous examples have been analyzed such as Amazon, Google or IBM. The statement of managers and academics is that in most cases, product or service innovation cannot sustain a competitive advantage today and companies have to rethink profoundly their business models (Amit and Zott, 2012). A study of the Economist Intelligence Unit (2005) has revealed that a majority of managers (54%) are more confident in business model innovation than in new products or services to develop a competitive advantage. 2Among the different BM innovations we have witnessed these last years, open innovation appears as introducing a breakthrough in the traditional way of doing business. Indeed, Chesbrough (2003) popularized the term and announced a paradigmatic change in innovation and knowledge sharing. Not only this open movement changes the innovation process but it also modifies organizations themselves by reconfiguring value chains and networks, leading to what is called open business models (Chesbrough, 2006). Examples are numerous especially in the Internet sector with companies such as Flickr or Apple, which have been able to develop platforms for the development of complementary products. Open BMs generate new sources of value through an increase in the rate of innovations and an improvement of the product diversity (Boudreau, 2010). Moreover, open BMs enable firms to cut off partly the cost of their innovation process (Chesbrough et al., 2006). Thus, open BM appears potentially as an interesting strategy for increasing value creation for customers and for economizing on costs for an innovator. 3However, thinking only about value generation and economizing may lead to a trap. Indeed, BM literature invites to reflect on value generation, on economizing but also on value capture mechanisms. These last ones depend heavily on the appropriability regime and on the ease to imitate the BM (Teece, 1986, 2010) indicating that the management of property rights lies at the core of the potential success of an open BM (Henkel, 2006). Thus, in this paper we would like to deepen the literature on open BM by focusing especially on the consequences of such BM at the individual (the organization level) and collective (the sector) levels, and on the conditions to use successfully this strategy. Thus, our general research question can be summed up as what are the conditions for success and consequences in terms of performance of the adoption of an open BM? Our line of reasoning is twofold. First, the BM innovation is often studied at the individual level of analysis. The study of the diffusion and impact of an open BM at the sector level is rare, even if we can anticipate that it changes radically a sector by implicating other companies, complementors or competitors (Lecocq and Demil, 2006). Secondly, the apparent paradox of an open BM is to share knowledge or innovation with others. Thus, in these conditions, how an innovator may generate and capture value becomes a puzzling question. 4We draw from the case of the Role Playing Game (RPG) sector to study the impact of the introduction of an open BM with a high level of openness (sharing of Intellectual Property –IP). This new BM was introduced by the leader to escape the stalemate in the sector. We analyze the case and try especially to illuminate the lessons of its initial success and its final failure. Indeed, the main mechanisms at the source of the success of the new BM were also the main sources of its failure. 5Despite the debates concerning its foundations and definitions, the concept of BM refers to a combination of organizational activities to generate value and sustain the development of an organization (Demil and Lecocq, 2010; Zott et al., 2011). The activities are bundles of competences and resources. Among these resources and competences, the innovation activity and the IP produced by this activity are prominent in a lot of sectors. Firms may envisage managing this activity very differently. In particular, Teece (1986) develops the ways a company may earn profit from its innovation by insisting on the potential disconnection between the knowledge a firm develops (patented or not) and the products in which this knowledge is embedded. Teece identified three main strategies by which the innovators can capture value from their innovations. In an integrated BM, the firm exploits alone its innovation and develops all the required activities along its value chain (manufacturing, sales, after-sales services, complementary services). In this view, the firm is autonomous as it copes alone with the innovation process and does not depend on partners, except its customers. At the other extreme, the company exploits its innovation through knowledge licensing –freely or not- but does not try to release its own products. Then, the success of the innovation depends entirely on the capacities of the coopetitors. An extreme example of such choice can be found in the open source movement to develop software. Between these two cases, the most common cases consist in a mixed approach where the innovator tries to extract value from an innovation by exploiting some activities in its value chain and by outsourcing some others, requiring then a selection process among potential partners. In these situations, the capacity to cooperate with partners and to establish adequate rules of governance becomes crucial. 6Firms are making choices to manage their innovation activities and particularly their IP and knowledge. 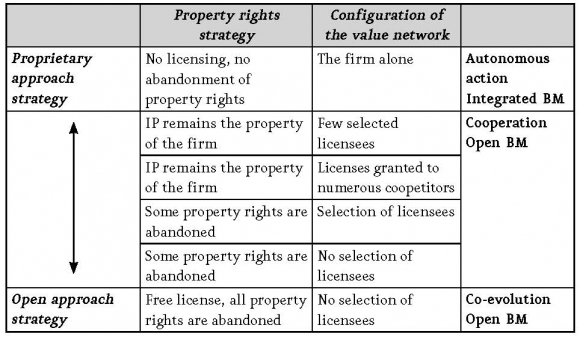 We name these choices property rights strategies as they relate to the openness and accessibility of IP and knowledge for coopetitors. These options can be represented alongside a continuum extended from totally proprietary to open source strategies with several fine-grained choices between these two extremes (Table 1)1. These strategic choices cover the way a firm keeps its knowledge and IP more or less proprietary, and selects or not partners to develop its innovation. The traditional conception of property rights deals with the proprietary approach. In this case, managers are invited to improve the strength of their patents and property rights, and their subsequent strategy is often envisaged from a defensive point of view (e.g. Shapiro, 1990; Fay, 1993). The other extreme of the continuum appears more recently in the literature and is more and more publicized with the open source movement. It consists in sharing freely an innovation with others in order to insure especially diffusion, product improvements or diversity. 7This continuum of property rights strategies requires several comments. First, an open BM implies that the innovation activities are divided among multiple partners and an open BM seeks to harness external parties (Chesbrough, 2006). Openness does not mean that the firm abandons all its IP or knowledge to everyone. Indeed, openness is largely a question of degrees, the firms choosing what they disclose and share (Henkel, 2006). As for open innovation, openness means that there is exchange of knowledge with external actors, for instance to accelerate the innovation process, to expand the market for the innovation, or to improve the quality of the innovation. In this view, a firm may choose to open some elements to some actors and restrict access to some others, such as in the case of Android that is open for the software developers but completely closed for the other OEMs. Secondly, the property rights strategy of a focal firm can evolve over time and consequently its BM (e.g. from an open strategy to a proprietary strategy or vice versa). For example, Intel adopted this dual clock property rights strategy by largely licensing its architecture in a first time to diffuse it before withholding licenses and developing a proprietary strategy (Afuah, 1999). 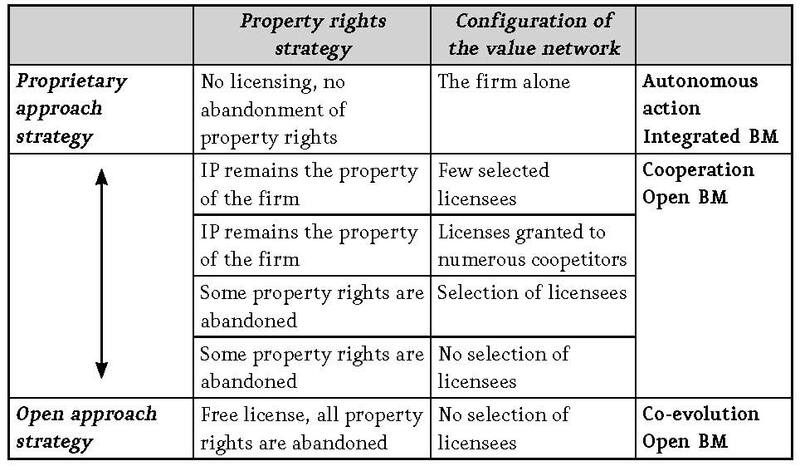 Finally, property rights strategies impact differently the structure of an industry and the strategies of the other firms (Kogut et al., 1995). Adopting a proprietary approach strategy leads to autonomous strategies and to disconnect competitors from each other. For users, it creates communities that are often locked into one supplier’s technology. On the contrary, an open approach strategy relies on cooperation and co-evolution and creates networks of connected coopetitors. Indeed, it allows many suppliers to use the technology and creates consequently interdependencies between different actors. 8Beyond the role and management of IP rights, open BM is also characterized by a given organization of the various stakeholders in the innovation and production processes. Boudreau and Lakahani (2009) have proposed different empirical configurations of open BM and identified in particular three types of open BM. 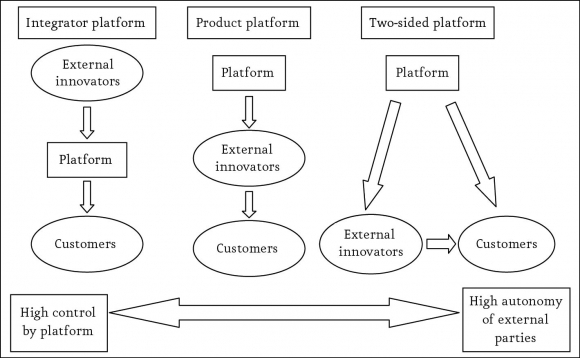 These configurations depend on the relationships between a sponsor who releases a platform (an open product), the external innovators who use the platform to release their own innovations and the final customers (Figure 1). The first open BM labelled ‘integrator platform’ refers to an open BM where the sponsor of the platform integrates external innovation to sell the final products to customers. 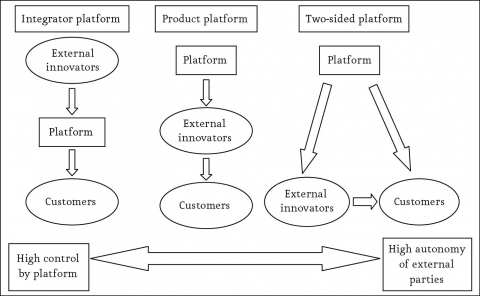 In the second case, external innovators use the platform to release their products that are then, sold to the customers. Finally in the ‘two-sided platform’ BM, external innovators and customers who are affiliated to the same platform, transact directly while the sponsor operates transaction with both sides. 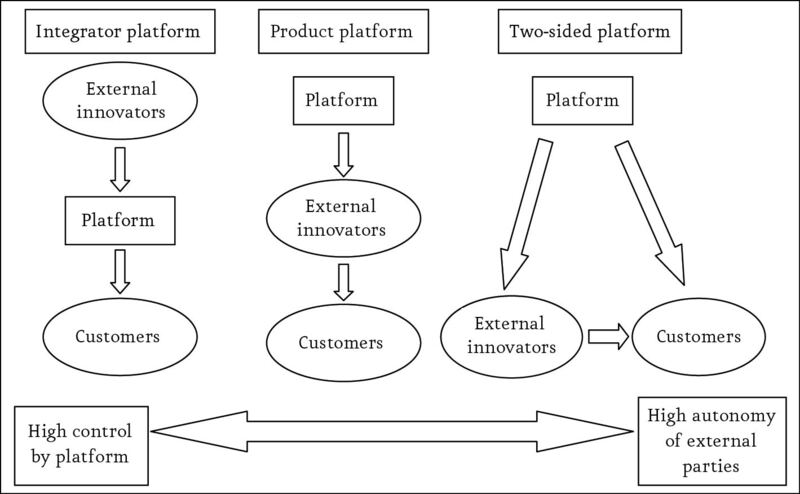 In this ‘two-sided platform’ open BM, external innovators and customers have a high autonomy as noticed by Boudreau and Lakhani (2009). In these last situations, we may wonder what are the risks associated with the implementation of such an open BM. 9In the next section, we introduce the empirical study of the RPG sector to explore the consequences of an open BM for the performance of the organizations, in the short and long term, and subsequently the conditions under which such an open BM are at risk. 10Our empirical study concerns Role Playing Game (RPG) industry, a niche market hobby of the toy industry. Despite a lack of some data – especially financial data –, the sector offers a rare opportunity to study an open BM from its inception to its abandonment. Indeed, it displays the advantage of witnessing the introduction of a new open BM at the end of the 90’s by the leader, Wizards of The Coast, and then its progressive return to a closer approach in 2008. Moreover, RPG is a low-tech industry and the study of innovation in such a sector remains rare. 2 These products are not electronic games but are played with pen and paper around a table. 11The population under investigation is constituted by tabletop English language RPG publishers2 releasing printed books until the advent of the Pdf files at the end of the 1990’s. While several publishers are either British or Canadian, the vast majority is based in the United States. Our empirical study covers the analysis of the RPG industry since its inception in 1974. 12The evolution of the industry was traced back from the qualitative data obtained from RPG publications (Comics and Games Retailer, D20 Magazine, Dragon Magazine), books (e.g. Schick, 1991; Fine, 2002; Mc Ed, 2010) and Internet websites (D20 Reviews, Game Manufacturers Association, Game Publishers Association, Gaming Report, RPGA Network, Wizard’s Attic). These sources provide qualitative material about the RPG industry, market segments, products and consumers. They are the main data sources we use in this article and they help to understand the characteristics of the sector. 13While some of these data where exploited elsewhere (see Lecocq and Demil, 2006), in this paper we go beyond the mere analysis of the first years after the introduction of an open BM in the industry, looking at the trajectory of the open BM and its termination in 2008, adopting a dynamic analysis. To understand the evolution of the sector from a quantitative point of view we rely on a dataset encompassing 476 RPG publishing companies and 6,112 products including both core rules and complementary products. Data were collected by crosschecking several convergent archival sources: a book on collectibles (Brown and Lee, 1998), and five databases found on the Internet and elaborated by fans3. These data help to figure out the impact of an open BM on the overall sector and particularly the number of editors contributing to the product system of the leader that have implemented an open BM. 14Finally, consumers’ opinions and interviews of key actors in the RPG industry were found on the following websites: D20 Reviews, Game Spy, Gaming Report, RPGNow, RPG Planet. These qualitative data allow understanding the mechanisms and rationales behind the choices of firms and consumers in the industry. 15The RPG is a hobby-game popularized in the 70’s with the worldwide success of a game called Dungeons & Dragons (D&D) designed by Gary Gygax and Dave Arneson. They invented entirely this new hobby, based on their shared passion for medieval war-games and for fantasy setting. The RPG entertainment form could be defined as “an activity in which a group of people (called the players) creates and role-plays characters in a world devised by another participant, called the Game Master, who describes the results of their actions as well as the actions themselves of everything and everybody else in this created world” (Kociatkiewicz, 2000, p. 71). Players and the Game Master (or the storyteller) follow rules found in books to create characters and to decide players’ actions. The game consists in a storytelling adventure involving generally 3 to 6 people who take on the roles of selected alter egos and interact orally with the other players around a table for several hours (Fine, 2002). From the inception of the sector, the companies earned money by selling books of rules (around 25$), but also numerous complementary products such as scenarios, books describing monsters, new settings or new kinds of characters (around 10$) (Brown and Lee, 1998). All these products were sold directly to customers and through game stores and hobby shops. What is fundamental is that most of these complementary products were usable and compatible only with the core products constituted by the related book of rules. Consequently, once a rule was successfully diffused, regular revenues from complementary products were guaranteed. 16Gygax and Arneson published their first fantasy RPG game in 1974 just after setting up a new company Tactical Studies Rule (TSR). Indeed, in 1973, Gygax decided that the only way to get the game out would be to publish it himself. The first year, the company sold only 1000 exemplars of their new game even if Gygax recall that “for every copy that we had sold there was at least two copies photocopied”. But the game diffused rapidly through the U.S. within a large community of fans via word-of-mouth, especially students, and their game reached around 7000 exemplars per month in 1979. Fanzines dedicated to the new hobby developed since 1975 and helped to make it successful. D&D became a full-fledged fad in the United States and “the best-known and best-selling RPG with an estimated 20 million people having played the game and more than US $1 billion in book and equipment sales” (Mc Ed, 2010, p. 2). This success attracted rapidly numerous other editors and led to the emergence of publishers, fan clubs, conventions, hobby magazines and the development of a specific sub-culture involving about five million people worldwide playing RPG at least once a month (Dancey, 2000; Fine, 2002; Booker, 2004). 17Despite this competition, TSR moved from a tiny two-people firm to a 300 employees-company in 1982 and reached sales of nearly US$ 20 million. It implemented as soon as 1980 in UK to distribute its products in Europe. Due to its rapid professionalization and regular product innovations, the company remained the leader of the sector for a long time. However, dozens of new entrants were entering the sector and were releasing new rules and thousands of complementary products, exploring new genres different from fantasy, even if this last one remain dominant among a dozen of genre which may be identified in RPG industry (western, space opera, horror, post-apocalyptic, super-heroes...). 18With the success, the strategic ambition of TSR during the 80’s was to create an entertainment company and to become the next Disney Company. As a result of this strategy, TSR was granting licenses to anyone that would take them. There were D&D beach balls, towels, toys, puzzles, and many other licensed items that made much less sense. Thus, despite it maintains a proprietary BM in its sector the D&D trademark became so valuable and the brand awareness so high that it enabled valorization of the trademark itself in other sectors. 19Barriers to entry are very low in the RPG activity. The business required only creativity and several hundreds of dollars to enter in and to edit books. Thus, 476 different editors were identifiable over the period 1974‑1999 through the quantitative data collected. Not surprisingly, the number of companies in the sector never really decreased as numerous entries and exits were annually recorded. But, whereas this proliferation of companies and products was not a problem as long as the RPG was a growing market in the 80’s – the heyday of the sector –, it became one when the sector endures the competition from other hobbies during the 90’s. Two of them were noticeable and attracted the traditional RPG’s fans: trading collecting cards and videogames. As a consequence, from the mid-90’s, the RPG was in crisis according numerous publishers. 20Facing this crisis, one of the TSR’s answers was to become incredibly hostile to everyone concerning the exploitation of its IP rights. As the Internet exploded onto the public consciousness in the early- to mid-90’s, D&D players naturally brought their chosen hobby online. TSR followed them, issuing dozens of cease and desist orders that shut down fan sites. The company even tried to prevent D&D fans from discussing the game in chat rooms and on message boards, earning derisive nicknames such as: “They Sue Regularly” (TSR) or “T$R”, to stress the appetence for money of TSR managers. The IP management dictated in detail everything that a licensor could do, from the color of a box to exactly which piece of licensed D&D artwork the licensee would be forced to use. Even Gary Gygax himself wasn’t immune. When Gygax created a new RPG system with Game Designer’s Workshop called Dangerous Journeys, TSR sued him for copyright infringement. Thus, at that time, the integrated BM resulting from a proprietary approach was enforced more strictly than ever and cooperation with coopetitors was not envisaged. “The downside here is that I believe that one of the reasons that the RPG as a category has declined so much from the early 90s relates to the proliferation of systems. Every one of those different game systems creates a «bubble» of market inefficiency; the cumulative effect of all those bubbles has proven to be a massive downsizing of the marketplace. I have to note, highlight, and reiterate: The problem is not competitive product, the problem is competitive systems. I am very much for competition and for a lot of interesting and cool products” (Dancey, 2002). 22Thus, instead of suffering from harsh and traditional competition between products, the sector was suffering above all from a competition between the numerous incompatible systems on the market produced by proprietary BM that tend to isolate each community of players and “create bubbles of market inefficiency”. This diagnosis was largely publicized in the sector and explains the following strategic initiative of the new leader. 23In the fall of 1998, Peter Atkinson the CEO of WOTC asked Ryan Dancey to take over the role of managing the RPG business and to understand what was wrong with this line of products after the acquisition of TSR. The basic idea of the new BM was presented to the CEO of Hasbro in 1999 and in early 2000, the new owner of D&D announced the release of the third edition of its blockbuster with a new system of rules: the “d20 system”, under an open license labeled the Open Gaming License (OGL). The OGL was a public copyright license under the control of a foundation set up by Ryan Dancey and granted permission for any tabletop RPG developers to modify, copy, and redistribute some of the content designed for their games, the Open Game Content (OGC) (Minion Development Corp, 2004). This OGC encompassed globally the game mechanisms and the algorithms of the game. Thus, it allowed commercial and non-commercial publishers to release complementary products to the system without paying for the use of the use of the system’s associated IP. 24Despite this openness, the d20 license was established by WOTC and remained under its control. Whereas more constraining, this d20 license enabled after accepting the terms of the license to use a compatibility logo with WOTC’s products and to refer to some of the leader’s products. Through this open BM, the sponsor (WOTC) explicitly aimed at promoting reciprocal compatibility between RPGs to boost demand and ultimately profits. The core idea of this strategic change was that the institutionalization of standardized rules of game could be achieved by the efforts of competitors. If WOTC could get more people in the industry to use the same system, players would learn only one system and be able to migrate from product to product and game to game without learning and transaction costs. While it would reduce the number of original gaming systems in the market, the idea was to increase the audience for everybody, especially for the leader. The ultimate goal was to establish “d20” as a recognizable trademark, like “VHS” or “DVD”. “It turns out, that for many types of problems, ‘Open Source’ development tends, on the whole, to be a better process than traditional, closed source development. The curious should look at www.gnu.org, www.opensource.org, and should seek out Eric Raymond’s essay ‘The Cathedral and the Bazaar’ via a lookup on any capable search engine. There is now a new, viable model for creating complex systems, using standardized protocols and interfaces that are shared by many people, with many independent sub-components that have to work together. Like roleplaying games” (Dancey, 2002). “Finally we reached a consensus on an umbrella theory that we could demonstrate accounted for most of the actual sales & play patterns we were observing in the market. That theory was based on a fairly obscure branch of economics called Network Effects. One of the odd properties of a gaming business is that it forms a network comprised of the players of the games, the groups they gather in to game with, and the games they play when they gather. Networks don’t tend to behave like typical economic systems. They do very odd things, because the network itself becomes a part of the value of the market. One network effect is called a Network Externality. A network externality happens when most of the value of a given product resides in the network connecting the users of that product together, rather than in the actual item that is being sold to those users. RPGs, it turns out, demonstrate strong signs of network externalities. Using the concept of the network externality, we began to be able to explain things that our data showed us to be true, even though the conventional wisdom said they were not. And one of the biggest things that data showed us was that a lot more people were playing D&D every month than were buying it – by a factor of 100!” (Minion Development Corp, 2004, p.4). 27The principles of this open BM were threefold. Firstly, any company could release henceforth its own products based on D&D’s rules of game. Secondly, the d20 license created an umbrella trademark (“d20”) for compatible RPGs. Whatever the publishing company, any product using the d20 system had to be labeled with the WOTC’s d20 logo, to indicate consumers the product compatibility with other d20 products. Thirdly, as a handful of specific D&D rules remained the property of WOTC, any firm using the d20 license to develop its own products must include a note on the cover of its products that it “requires the use of a Roleplaying Game Core Book published by Wizards of the Coast, Inc”. Consequently, although the d20 license constitutes an open BM, granting partially IP to competitors, it does not prevent the sponsor drawing potentially revenues from the sales of the core D&D book. Thus, WOTC was expecting to generate new sources of revenues by allowing numerous innovators to develop new products for customers. 28Given its characteristics, d20 license can be considered as a two-sided platform in the framework of Boudreau and Lakhani (2009) previously evoked (see figure 1). 29To understand the impact of the new BM, we led a comparison between two periods of two years. Indeed, the change of BM introduced by the leader impacted rapidly the overall sector as demonstrated in a previous paper (Lecocq and Demil, 2006). We have studied especially the structure of the sector in terms of the number of companies and the systems of games they adopt, before and after the release of the new BM to analyze the transition from a proprietary BM to an open BM. We distinguish an open BM as the BM of a company adopting the new d20 system, a proprietary BM as a company releasing incompatible products (traditional BM in the sector), and finally, a hybrid BM characterized by companies releasing both open and proprietary products (Bonaccorsi et al., 2006). 30Two main effects occurred after the release of the d20 in 2000. First, the open BM created clearly an entry inducement. After the introduction of the open BM, the number of new entrants arrived in the sector to benefit from the new d20 system and from the reputation of the leader (Table 2). The 2000–01 period saw 78 new entrants into the RPG sector, with only 20 new entrants in the 1998–99 period (c2 = 12.35, significant at the 0.01 level). Secondly, the majority of the new entrants adopted the open BM. Of the 78 new entrants in the 2000–01 period, 51 adopted the d20 license (Table 3). This proportion was markedly greater than for incumbents (c2 = 17.89, significant at the 0.01 level). “It [third edition] is hugely, wildly successful. We are extremely happy with it. I am dancing on my chair as I write this to celebrate. The Core books continue to sell very strongly and in fact picked way up this summer. We are 50% above our projections for Core book sales for the year” (A. Valterra, RPG Business Manager for WotC; EN World, nov. 2001). 32The factual data we collect corroborate this impression that d20 gained rapidly a large audience in the sector (Table 4). If success is apprehended with the release of d20 products (sold as books or Pdf files), this success came very shortly after the release of the 3rd open edition of D&D, reinforced by the massive use of Pdf at that time. It was used both by individuals and professional publishers. 33Beyond the number of products released, the sales figures indicated also an impressive difference between d20 and non-d20 products. For instance, the average units of d20 products sold reached 100 for the second quarter 2004 in an important retailing website (RPGNow), whereas they were only 40 for closed BM (Minion Development Corp, 2004, p. 37). Similarly, d20 publishers typically see 75-200 units sold the first month after their release whereas non-d20 publishers record only 10-25 units sold the first month (Minion Development Corp., 2006, p. 76). However, as Table 4 demonstrates, the huge success of d20 system in the few years after its release began to erode from the mid 2000’s. 34Overall, the first objective of the leader was reached. The open BM attracted rapidly an important support in the sector, especially by new entrants who released compatible products with the new platform. This success was amplified by the rise of electronic publishing (Pdf files), since small companies were now able to tap the huge market potential of D&D at very low cost. For new entrants, the open BM was clearly a good opportunity to grasp. But many major incumbent companies produced also contents for the d20 system. For several years, d20 system products took a significant market share of the RPG industry. As expected, the success of the open BM relied heavily on the incentives of openness which allows other publishers to release complementary products to the system without paying for the use of the associated IP rights. However, the success turned into a failure for two reasons that explained the official abandonment of this open BM in 2008, giving publishers one year to sell off their d20 products. “If you read the text of the Open Gaming License (version 1.0a), it actually restricts companies from using certain terms in their books. For example: You agree not to indicate compatibility or co-adaptability with any Trademark or Registered Trademark in conjunction with a work containing Open Game Content except as expressly licensed in another, independent Agreement with the owner of such Trademark or Registered Trademark. This means that saying our books are compatible with Dungeons & Dragons is a violation of the Open Gaming License. In addition, the d20 System Guide, v5.0 states: You may refer to the Players Handbook by title or as the PHB. […] You must not cite page number references… Technomancer Press finds these requirements to be restrictive and more beneficial to Wizards of the Coast than any of the d20 System licensees. We also find it to be hypocritical, considering that Wizards of the Coast’s initial product line consisted of books intended to be used in other role-playing systems” (Technomancer Press website, October 5th, 2006). 36This extreme position from an isolated publisher reflects a general assumption in the sector consisting in defending more the open movement (OGL) than the d20 system license over which WOTC exerts a strict control and may change at will. Indeed, if all d20 products have to use the OGL to make use of d20 system, the publishers were able to use OGL without using the d20 license. By this, a publisher was not bound by the restrictions of the d20 license and the capacity of WOTC to change the license at will as indicated by the following clause of the license: “Changes to Terms of the License - Wizards of the Coast may issue updates and/or revisions to this License without prior notice. You will conform in all respects to the updated or revised terms of this License. Subsequent versions of this License will bear a different version number” (Article 9, The D20 System Trademark License version 6.0). “Sometimes it seems that people are willing to do anything but learn the rules for using the licenses [OGL/d20]. I get a lot of phone calls and e-mails from start up companies who have a ton of questions. It takes about three questions and I realize they don’t even know the difference between the OGL License and the d20 license, in fact they haven’t read the licenses.” (A. Valterra, RPG Business Manager for WotC; EN World, nov. 2001). 39Thus, despite all the information diffused by WOTC and the explanations it provided, it appears that a lot of infringements to IP were observed and that WOTC had difficulties to control the behavior of other publishers, especially new ones. “The number of companies that started doing d20 products has already been reduced. The good ones will stay around. D20 is a great idea and allows a little guy to have his chance in the sun. My only major concern is rising prices as a result of fewer sold books. It’s hard to stand out in the d20 field without some gimmick or license.” (D. Arneson (co-author of D&D in 1974); EN World, 06/28/2004). “Try not to think that hitching your wagon to the d20 train means automatic success. The market is flooded with d20products and there are books on just about every conceivable topic, race, class, monster or setting for it, especially if you take into account the smaller press. The market is very competitive, so you’ll need to have a truly outstanding product (preferably something nobody else has touched upon), and a touch of class to have a chance of doing really well in this area. The same follows, substantially, for OGL material. Don’t think that other licenses necessarily offer a safe harbor from these problems as they have problems of their own, chiefly a lack of brand recognition.” (Minion Development Corp., 2004, p.7). 41These citations indicate several negative effects that explain the decrease in the release of d20 products after 2005. First, it appears that the number of companies –both professional and amateur- in the sector increased so largely that it creates too many products in the market. In the meantime, the RPG sales continued to decline and the market was unable to absorb so many new products (McEd, 2010). Secondly, it became difficult to make choice for consumers among hundreds of products. It was especially problematic when products of highly varying quality – from crappy products to high-quality standard – were on the market and the institutions built to counteract the quality uncertainty (such as logos and trademarks) were deficient (Akerlof, 1970). At least, the search costs for consumers were significantly increased to find products of quality. This quality issue was pointed out by the article 4 of the license: “Quality Standards. The nature of all material you use or distribute that incorporates the Licensed Articles must comply with all applicable laws and regulations, as well as community standards of decency, as further described in the d20 System Guide. You must use your best efforts to preserve the high standard and goodwill of the Licensed Trademarks. In order to assure the foregoing standard and quality requirements, Wizards of the Coast shall have the right, upon notice to you, to review and inspect all material released by you that uses the Licensed Articles. You shall fully cooperate with Wizards of the Coast to facilitate such review and inspection, including timely provision of copies of all such materials to Wizards of the Coast. Wizards of the Coast may terminate this License immediately upon attempted notice to you if it deems, in its sole discretion, that your use of the Licensed Articles does not meet the above standards” (Article 4, The D20 System Trademark License version 6.0). 42Finally, the overcrowding in the market created a supplementary incentive for publishers to differentiate their products by acquiring expenses licenses of well-known trademarks such as Star Wars, comic book series or TV shows, inducing paradoxically rising prices for consumers. 43Even from the point of view of the leader, the d20 system was probably not as successful as expected. We have no profit figures to provide on this point, but WOTC laid off its licensing director in 2008 and with the release of the 4th edition of D&D in 2008, the company revoked the original d20 license, replacing it with a new license specifically for D&D, known as the Game System License (GSL). The terms of this license are similar to the d20 license, but there is no more association with the OGL, and thus, no more content totally open. It is noticeable that the new GSL is incompatible with the previous OGL as many publishers suggest this restriction represents a direct attack on the OGL which WOTC is legally unable to revoke. This restriction has fostered some negative feelings within the RPG communities against the leader and resulted in many publishers who previously supported the d20 system to reject the 4th Edition of D&D entirely. As a consequence, a lot of publishers which were previously adopters of the d20 system decided to develop their own set of rules based on elements of the OGL and publishing their own material under the OGL. 44Indeed, while the new GSL license can be interpreted partially as a return to the original proprietary BM of the leader and at least a will to end the open license policy, it appears that numerous publishers turn towards the OGL more than in the d20 area. 45In this study, we trace back the evolution of a sector where the leader moved from a proprietary BM to an open BM, more specifically a two-sided platform BM (Boudreau and Lakhani, 2009). The main interest of the article is especially to connect the strategic motives to transform a proprietary BM and the impacts of a BM with a high level of openness on the overall sector. At least, our research shows that open BM (and its antecedent open innovation) encompasses various kinds of approach (from simple R&D partnership to open source) and that the consequences of the adoption of such BM may vary greatly. Of course, this analysis concerns only a micro market which has little economic weight by itself, probably less than US $10 million today. Moreover, three potential limitations of this research may be noted. First, studying RPG industry, we have observed a specific open BM. Indeed, the d20 system appears as a highly open BM as it is based on the partial abandonment of IP rights by WOTC. Most of times, open BM encompasses forms of partnerships which do not necessary lead to complete IP openness (Henkel, 2006). The entry inducement and the large adoption of the d20 system that we have observed in the RPG industry have been probably reinforced by this high level of openness of the BM. Second, WOTC, the company that has introduced the open BM, was the leader on the RPG market. We may wonder if the same rise and fall of this BM would have been observed with the case of a less prominent company. For instance, some reactions of rejection were observed due to the fear of a complete dominance of the leader over the market. Third, an alternative explanation for the failure of the open BM consists in considering that the RPG market was declining since the 90’s and that this decline continued despite the d20 system, inciting the leader to abandon his initiative. 46Despite these limitations, some interesting lessons can be drawn from the case exactly because of its modest size and the easiness to detect the moves and reactions of the firms. Moreover, the open BM under study was also adopted by major firms in other important sectors (Chesbrough, 2006) and the RPG is finally a sector where products embedded intensive knowledge, even if it appears as a low-tech sector (Lecocq and Demil, 2006). Thus, the case allows a theoretical generalization (Yin, 2005). Given the results and limitations, several contributions of the paper may be highlighted. 47First, industry structure is traditionally and theoretically apprehended in economics as related to the number of firms, the entry barriers and the average size of companies on the market. In the RPG industry, the new open BM modified largely each of these characteristics: the number of companies increased due to a decrease of the entry barriers, and the average size decreased after numerous new entrants appeared. Thus, an open BM has the power to modify profoundly the structure of a sector. In a more sociological view of markets, these modifications of the market structure follow the modifications of relationships between the actors of the market and favor the emergence of co-evolution instead of autonomous evolution (see Table 1). Indeed, the intended result of the open BM was exactly to reshuffle the relationships between actors and especially to connect all the actors whereas the market was previously highly fragmented in multiple micro-communities. An open BM unified potentially most of the communities in a market by allowing the sharing of a common platform that incorporated a common knowledge, as it has been observed in OSS (West, 2003). These new relationships can be considered as creating value for consumers by decreasing the “knowledge tax”5 on the market, the interoperability costs between products and by increasing the choice within the same system. For companies, the open BM creates also value by increasing the global potential of the market and by benefiting from the possibility to create new products as patches of a global system and not to start from scratch. These modifications in the relationships between actors concern also entrepreneurs who are not initially in the market. Indeed, the success in the diffusion of the d20 lies partly in its capacity to attract new entrants (Kogut et al., 1995), indicating that the sponsor of an open BM should always envisage the arrival of new actors and not only concentrates on the current actors of its market. 48Second, the case indicates also the pitfalls of an open BM. Indeed, the end of the open BM in 2008 underlines the difficulties for a sponsor to capture a share of the potential value created for consumers. This decision indicates that a sponsor may encounter several difficulties after introducing an open BM. A company adopting an open BM may have difficulties to impose IP rights, especially in a sector where amateurism prevails, and subsequently to capture value. But beyond value capture, the case of the RPG industry also demonstrates that the success of an open BM in the short term in terms of value creation may lead to a drastic change in the value creation in the mid or long term. We have observed especially an overcrowding of the market with an intensification of the competition and a subsequent increase in the search costs for consumers to identify products, a higher variability in product quality, and difficulties for consumers to sort the wheat from the chaff. This observation suggests that the value creation and value capture mechanisms have to be grasped dynamically as they evolve themselves with the structure of the sector. Having adopted a longitudinal view of the sector, we are able to distinguish a first period of success when the open license was heavily supported by coopetitors and the discourses were enthusiastic. But over time, openness allows the emergence of numerous publishers and products with heterogeneous quality overcrowded the market. Whereas we recorded around 6200 different products from 1974 to 1999, the number of d20 products alone accounts for more than 3800 from 2000 to 20096. Thus, if learning costs decreased for customers by unifying different systems, the search costs for products of quality increased importantly with the number of products based on d20 system. As a consequence, it was not only the value capture process that suffers from the openness but also the value creation process. Thus, what we observe here is that open BM may also in the mid-term lead to reduce value creation for customers. Another problem for the leader was the difficulty to anticipate the number of adopters of its d20 license. When a company decides to grant restrictively licenses to few licensees, it may select them drastically on the basis of their complementary assets. However, with an open BM diffusing knowledge and IP without strong selection mechanisms of partners, the risk is to diffuse too largely these elements and to see the burst of coordination and control costs. That’s why -in our view- in RPG industry the leader terminates its open BM in 2008. From a general point of view, we may wonder if the open BM constitutes a sustainable strategy or if it has to be considered as a temporary movement to reach some goals before coming back to a closer approach (Garud et al., 2002). Indeed, an open BM promotes co-evolution between firms within an industry instead of autonomous and competitive trajectories of systems. Thus a sponsor promoting an open BM may gain control over its sectors in the short-term but may lose, at least partially, control over future evolutions in the sector. 49In the same line, our case points to the difficulties of succeeding financially with an open BM. Indeed, the case describes a semi-failure for the leader implementing the open BM. This contrasts with the relatively optimistic tone of the open innovation literature, presenting the open processes as a new ‘one best way’ to innovate and to succeed. In the RPG case study, the openness enables to attract numerous coopetitors and to innovate in terms of product at the level sector. It enables also to establish a standard shared by the competitors and to avoid the bubble of market inefficiencies denounced by the sponsor of the initiative. This standardized platform can be viewed as a way of reducing transaction costs for consumers because traditionally, learning costs occurred each time a con­sumer has to learn how to use each product. Thus, in terms of value generation, the open BM enables at short term to offer more diversity and reduce transaction costs for consumers. The problems arise when value capture is considered. Indeed, the abandonment of the open BM in 2008 tends to demonstrate the inefficiency of the partial openness of knowledge and IP for the leader. Different mechanisms sap potentially the value capture of WOTC. This result echoes the observation of Dahlander and Magnusson (2005) in the open software communities. Profit-driven companies adopting openness may be confronted with communities driven eventually by social values and the cohabitation of different rationales may render difficult the cooperation and the acceptance of the dominance of an actor over a community. 50Third, the case study illustrates how a leader may impact its overall sector by changing its BM. In the RPG sector, the open BM created clearly an entry induction by offering opportunities for new entrants and transformed subsequently the structure of the sector at least in terms of new entrants and barriers to entry. Thus, an open BM supported by a leader may incite others to establish more cooperative relationships between the firms of a sector, generating potentially more value for consumers. Indeed, with this open BM, new products proliferate on the market and diversity increased at the product-level for any consumers, making compatible what was previously incompatible. Consequently, the BM innovation should be envisaged as a potential way to restructure the relationships between customers but also complementors and not only as a way to differentiate from competitors. Indeed, traditionally the literature recognizes the role of BM innovation to reshape entire industries, but generally this shake out is related to an exceptional success of a company which is imitated or not. Successes such as Amazon, Apple or Southwest Airlines have been recognized for a long time as major BM innovators because they change radically the competitive landscape in their respective sectors. But thanks to a global view on an entire population, we can observe that there is other ways to reshape a sector if a company has a prominent position in a sector. Thus, this conclusion holds potentially only for leaders or co-leaders or, at least, for companies having assets of great value for other coopetitors. 51Finally, some recommendations can be drawn at the end of our study relatively to the open BM. In terms of methodology, the performance of an open BM can be apprehended very differently according the period of observation. Over time, performance of such initiative may evolve drastically and researchers should pay attention to avoid focusing only on short period of observation. In our view, what explain or not the success of such a BM is a cumulated set of transactions, not isolated one (Demil and Lecocq, 2006). For instance, need for coordination or control may evolve exponentially over time and generate rapidly huge costs. Another methodological point relates to the performance targeted by the sponsor of an open BM. The success of this strategic choice depends heavily on the objectives pursued. They can be to reduce R&D costs, to face shorter product life-cycle, impose a standard, or increase revenues (Chesbrough, 2006; Garud and Kumaraswany, 1993; Garud et al., 2002). In the RPG case, financial interest was at the heart of the implementation of an open BM. Thus, despite its success in terms of adoption and diffusion, the open BM did not allow WOTC to make a lot of money after a few years. This point recalls that any open BM should be evaluated according to its initial objectives. But, as the success of an open BM depends on cooperation or co-evolution – and thus, is partially out of the control of the firm-, there are risks that unanticipated elements affecting performance arise. In terms of managerial recommendations, a company should pay attention to strategic flexibility when adopting an open BM, i.e. the capacity to avoid irreversible choices. In our case, the leader’s BM evolves from a proprietary to an open then, finally, to a less open BM. This sequence illustrates the fact that a company may need to come back in the openness of its BM. Thus, diffusing cautiously IP and knowledge and keeping an eye on the aggregate consequences of open innovation should be a golden rule for any company moving into this path. AFUAH, A. (1999), “Strategies to turn adversity into profits”, MIT Sloan Management Review, vol. 40, n° 2, pp. 99-109. AKERLOF, G. A. (1970), “The market for “lemons”: Quality uncertainty and the market mechanism”, The Quarterly Journal of Economics, vol. 84, n° 3, pp. 488-500. AMIT, R. & ZOTT, C. (2012), “Creating value through business model innovation”, MIT Sloan Management Review, vol. 53, n° 3, pp. 41-49. BAIN, J. (1956), Barriers to New Competition, Cambridge, Mass. : Harvard Univ. Press. BARNEY, J.B. (1991), “Firm resources and sustained competitive advantage”, Journal of Management, vol. 17, n° 1, pp. 99-120. BONACCORSI, A., GIANNANGELI, S., & ROSSI, C. (2006), « Entry strategies under competing standards: Hybrid business models in the open source software industry”, Management Science, vol. 52, n° 7, pp. 1085-1098. BOOKER, C. M. (2004), “Byte-Sized Middle Ages: Tolkien, Film, and the Digital Imagination”, Comitatus: A Journal of Medieval and Renaissance Studies, vol. 35, pp. 145‑174. BOUDREAU, K. (2010), “Open Platform Strategies and Innovation: Granting Access vs. Devolving Control”, Management Science, vol. 56, n° 10, pp. 1849-1872. BOUDREAU, K. & LAKHANI, K. (2009), “How to Manage Outside Innovation: Competitive Markets or Collaborative Communities?”, MIT Sloan Management Review, vol. 50, n° 4, pp. 69-75. BROWN, T. et LEE, T. (1998), Official price guide to Role Playing Games, The Ballantine Publishing Group, first edition. CASADESUS-MASANELL, R. & RICART, J. E. (2010), « From strategy to business models and onto tactics”, Long Range Planning, vol. 43, n° 2/3, pp. 195-215. CHESBROUGH, H. W. (2007), “Why companies should have open business models”, MIT Sloan Management Review, vol. 48, n° 2, pp. 22-28. CHESBROUGH, H. W. (2003), The Open Innovation: The New Imperative for Creating and Profiting from Technology, Harvard Business School Press: Boston, MA. CHESBROUGH H. W. (2006), Open Business Models: How to thrive in the new innovation land­scape, Harvard Business School Press: Boston, MA. CHESBROUGH, H. W. & ROSENBLOOM, R. S. (2002). “The role of the business model in capturing value from innovation: Evidence from Xerox Corporation’s technology spinoff companies”. Industrial and Corporate Change, vol. 11, n° 3, pp. 533-534. CHESBROUGH, H. W. & VANHAVERBEKE, J. WEST (eds) (2006), Open Innovation: Researching a New Paradigm, Oxford University Press. DAHLANDER, L. & MAGNUSSON, M. G. (2005), “Relationships between open source software companies and communities: observations from Nordic firms”, Research Policy, vol. 34, pp. 481-493. DANCEY, R. S. (2000), “Adventure game industry - market research summary”, February 07, V1.0. DANCEY, R. S. (2002). “The most dangerous column in gaming – Open Gaming Interview with Ryan Dancey”, (http://www.wizards.com/dnd/article.asp?x=dnd/md/md20020228e). DEMIL, B., & LECOCQ, X. (2006), “Neither Market nor Hierarchy nor Network: The Emer­gence of Bazaar Governance”, Organization Studies, vol. 27, n° 10, pp. 1447‑1466. DEMIL, B. & LECOCQ, X. (2010), “Business Model evolution: In search of dynamic consistency”, Long Range Planning, vol. 43, n° 2/3, pp. 227-246. Economist Intelligence Unit (2005), “Business 2010 – Embracing the challenge of change”, The Economist, 34 pages. FAY, R. J. (1993), “Nurturing your intellectual property”, Management Review, vol. 82, n° 9, pp. 62-63. FINE, G. A. (2002), Shared Fantasy. Role-Playing Games as Social Worlds, University of Chicago Press: Chicago, IL. GARUD, R. & KUMARASWAMY, A. (1993), “Changing competitive dynamics in network industries: an exploration of Sun Microsystems’ open systems strategy”, Strategic Management Journal, vol. 14, n° 5, pp. 351-369. GARUD, R., JAIN, S., & KUMARASWAMY, A. (2002), “Institutional entrepreneurship in the sponsorship of common technological standards: the case of Sun Microsystems and Java”, Academy of Management Journal, vol. 45, n° 1, pp. 196-214. GIESEN, E., BERMAN, S. J., BELL, R., & BLITZ, A. (2007), “Three ways to successfully innovate your business model”, Strategy & Leadership, vol. 35, n° 6, pp. 27-33. HENKEL, J. (2006), « Selective revealing in open innovation processes: The case of embedded Linux », Research Policy, vol. 35, n° 7, pp. 953-969. JOHNSON, M. W., CHRISTENSEN, C. M., & KAGERMANN, H. (2008), “Reinventing your business model”, Harvard Business Review, December, pp. 50-59. KOCIATKIEWICZ, J. (2000), “Dreams of Time, Times of Dreams: Stories of Creation from Roleplaying Game Sessions”, Studies in Cultures, Organizations & Societies, vol. 6, n° 1, pp. 71-86. KOGUT, B., WALKER, G., & KIM, D. J. (1995), “Cooperation and entry induction as an extension of technological rivalry”, Research Policy, vol. 24, n° 1, pp. 77-96. LECOCQ, X. & DEMIL, B. (2002), « Open Standard: Role of Externalities and Impact on the Industry Structure », Open Source Community, Massachusetts Institute of Technology (http://flosshub.org/sites/flosshub.org/files/lecocqdemil.pdf). LECOCQ X. & DEMIL B. (2006). “Strategizing Industry Structure: The Case of Open Source in Low Tech Sector”.Strategic Management Journal, 27 (9): 891-898. McED (2010), Dungeons & Dragons – History & Overview, 189 p. Pdf File. Minion Development Corp. (2004), ePublisher D20/ OGL Guide, 45 pages. Minion Development Corp. (2006), ePublisher Guide – The definitive guide to electronic publishing for the RPG / Game industry, 3rd edition, 82 pages. REED, R. K. & STORRUD-BARNES, S. F. (2012), “Open innovation and the implications for sustainable profits”, in Audretsch, D. B., Dagnino G. B., Faraci R., & Hoskinsson R. E. (eds. ), New Frontiers In Entrepreneurship – Recognizing, Seizing and Executing Opportunities, Springer, Chap. 11, pp. 223-242. RUMELT, R. P. (1987), « Theory, strategy, and entrepreneurship », in Teece D. J. (Ed. ), The competitive challenge: Strategies for industrial innovation and renewal, Cambridge, Mass. : Ballinger, pp. 137-158. SCHICK, L. (1991), Heroic worlds: a history and guide to Role Playing Games, Prometheus Books. SHAPIRO, A. R. (1990). “Responding to the changing patent system”, Research Technology Management, vol. 33, n° 5, pp. 38-44. SVEJENOVA, S., PLANELLAS, M., & VIVES, L. (2010), « An individual business model in the making: A chef’s quest for creative freedom”, Long Range Planning, vol.43, n° 2/3, pp. 408-430. TEECE, D. J. (1986), “Profiting from technological innovation: implications for integration, collaboration, licensingand public policy”, Research Policy, vol. 15, n° 6, pp. 285-305. TEECE, D. J. (2010), “Business models, business strategy and innovation”, Long Range Planning, vol. 43, n° 2/3, pp. 172-194. WEST, J. (2003), “How open is open enough? Melding proprietary and open source platform strategies”, Research Policy, vol.32, n° 7, pp. 1259-1285. YIN, R. K. (2005), Case study research: design and methods, Thousand Oaks: Sage, 3rd edition. ZOTT, C., AMIT, R., & MASSA, L. (2011), “The business model: recent developments and future research”, Journal of Management, vol. 37, n° 4, pp. 1019-1042. 1 Compared to Teece (1986), the continuum we propose introduces the extreme case of open source. We are also distinguishing several strategic choices according the number of licensees and the assets that a firm keeps proprietary. 3 Pen & Paper encyclopaedia: http://www.pen-paper.net/index.php; RPG Index encyclopaedia: http://index.rpg.net/; Darkshire encyclopaedia: http://www.darkshire.net/~jhkim/rpg/encyclopedia/; Drosi encyclopaedia (in Deutsch): http://www.drosi.de/lexikon.htm; Guide du Rôliste Galactique (in French): http://www.legrog.org/. 4 At the end of 1996, despite a turn-over of U.S. $ 40 million, TSR found itself in a cash crush and was over $ 30 million in debt. Therefore, in 1997 the company was sold to Wizard of the Coast –the inventor of the collectible cards hobby-, itself bought by Hasbro in 1999. 5 “Because those rules are not interoperable, you have to pay a “knowledge tax” every time you want to use a product from a different publisher. […] The real effect of that diversity is to reduce the value of the products you own!” (R. Dancey, 2002). Benoît Demil et Xavier Lecocq, « The Rise and Fall of an Open Business Model », Revue d'économie industrielle, 146 | 2014, 85-113.